Recycling once is great, but what if our space transport system was as reusable as a train car? Futurism fans: To create this content, a non-editorial team worked with SkyWay Technologies Co., who sponsored this post. They help us keep the lights on. This post does not reflect the views or the endorsement of the Futurism.com editorial staff. In March of 2017, the private spaceflight company SpaceX made history when they re-used a rocket booster on a second launch. All told, the company spent less than half of what they normally would on that component, and for the first time, the expensive hulk of metal didn’t burn up or go rusty after one use. These are impressive cost and waste reductions to the space transport industry, sure—but they could be better. In fact, even though rocket refining and recycling is improving drastically, these space companies acknowledge their exploration devices are still expensive and inefficient. And if the goal of improved, recyclable missions is to build a sustainable space industry, then shouldn’t the way we send the gear skywards be green, too? Even our latest rockets, for example, are still inefficient. For how hulking the structures are, they carry a tiny amount of cargo into space compared to their overall size. Only 4.5 percent of the weight on SpaceX’s Falcon Heavy was actual gear—and that’s a massive improvement from NASA’s Space Shuttles, which were only 1 percent cargo. All that essential, but not actually useful, extra weight jacks up the cost of a mission. Falcon Heavy launches cost $1.2 million USD per ton of payload. Again, that’s a crazy improvement from earlier missions, but that many zeros on a space mission mean these launches will stay out-of-reach for consumers or smaller companies. And then there is the environmental cost. These souped-up rockets use more fuel, and Falcon rockets rely on what’s basically kerosene and oxygen. Per launch, the carbon these missions spew isn’t that much. 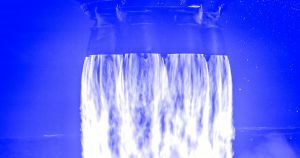 But if space flight frequency reaches the twice a month threshold that SpaceX is aiming for, experts think the overall carbon output could reach 4,400 tons a year. If every private space company chimes in with their own launch emissions, that number could climb dramatically. There are also all the potential atmospheric impacts that we don’t understand very well. Burning rocket fuel emits soot and a chemical called alumina, and scientists have started to study how these molecules break down our ozone layer, something we’ve been working hard to restore over several decades. To be fair, the research on the carbon emissions and pollutants from rocket launches is barely off the ground. Experts believe as the take offs become more frequent, it will be worth investing more time and money in understanding how their byproducts affect our atmosphere. If we know what the emissions might do before their quantity sky rockets (no pun intended), it would be easier to install meaningful legislation and force the industry to make more sustainable choices. These are the questions and possibilities we’ll have to consider eventually, and the industry isn’t even at the scale so many entrepreneurs think it will eventually reach. But what if we replaced all those rockets with a different transport system? Say, an electric-powered space conveyor system? The concept was introduced by Anatoly Yunitskiy in 1987, at a meeting intended to crowdsource new ideas on how to make the space industry less rocket-based. And in the 30 years since, Yunitskiy has honed the idea with SkyWay Technologies. Called the Global Planetary Vehicle, this electric-powered transport system would take cargo into the stratosphere on a track. As it completes a circuit around earth, the GPV can drop off supplies at each industry station that’s operating in our stratosphere. When complete, the track will deliver supplies up to 100 times a year, with cargo costs sitting around $1,000 USD per ton. Why haul all these materials out to space? It’s not all just for exploration—it’s because there’s a good chance of growing the manufacturing industry out in that dark, empty expanse. Researchers are already looking at the possibility of 3D printing organs, assembling fiber optic cables and building solar panels in low-orbit. The frigid and buoyant, zero-g conditions could facilitate all these projects and more. Additionally, manufacturing outside our atmosphere would mean any byproducts wouldn’t get trapped within our planet, and wouldn’t contribute to the earth-warming effects of expanding terrestrial industry. And seeing as the deadline to limit global warming is coming up quick, it might be worth considering what locations allow for less-harmful societal growth. Though all the engineering components are already commonly-used, completing all the necessary research, design and construction work will take about 20 years and $2 trillion dollars—or three years of the U.S. military budget. In fact, other engineering groups have been doing the math on similar projects called space elevators. The Tokyo-based construction group Obayashi plans to have their version built by 2050, and a research team also based in Japan began testing how elevators function in zero gravity in 2018. Nearby, a Chinese space launch group plans to have their rendition running by 2045. Of course, the specs on these elevators compared to Yunitskiy’s GPV are slightly different. Most materials needed for the GPV are already commonly-used, while several space elevator designs are waiting on carbon nanotubes or other yet-to-be-named elements for their design. Additionally, space elevators are a simpler “there and back” system—the point of the GPV is that it can circle around the earth and deposit materials in several places. 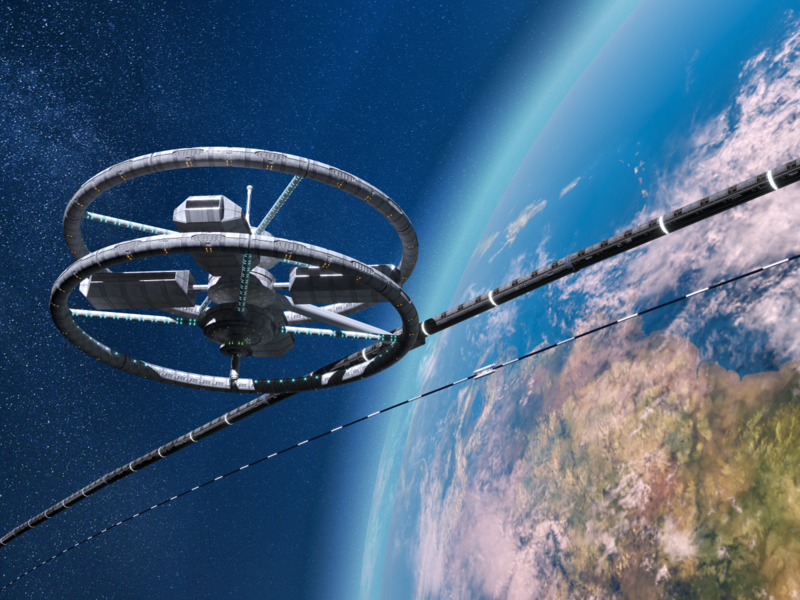 The GPV, compared to a space elevator, makes multiple stops around the world. There are some similarities, however, in the way space debris—the flecks and chunks of disintegrated gear whipping through our atmosphere—could damage these space systems’ infrastructure, though experts think this threat is manageable. And while there is a remote possibility a massive tether pulling into space would slow our earth’s spin down a tiny amount, the bigger question might be: Is this project worthwhile, seeing as we have so many other problems on earth to fix? That’s a dilemma that’s open for debate, but if the final product can take the place of all the rockets we’re preparing to launch for our space industry future, investing in a single, fossil fuel-free transport system seems worth the money. And besides, it won’t require any engineers to save a booster rocket from crashing into salt water.